ㄴ Use the keypad to enter the amount of times you wish to make use of this function, or press the [MAX] button. - Tower of Infinity will automatically move to the next floor 3 seconds after clearing a floor. - Arena will automatically restart 10 seconds after ending a battle. ㄴ If no other action is taken, Arena will run automatically until all the tickets you own are used up. ㄴ The new mid-boss will appear every hour. - The menu and mini map on the right side of the screen can now be hidden separately. ㄴ Tap the [>] button to hide. - The quests on the left side of the screen can now be hidden. ㄴ Tap the [<] button to hide. ㄴ Lock Pets by tapping the [Lock] icon after selecting a Pet in [Pet Management] > [Companion]. ㄴ Locked Pets will be marked with a padlock and will not be included as material during Fusion. ㄴ You can sort by Rank / Level / Special Stats / Appearance. - You will be able to view Pet stats directly from the list of owned Pets in Pet Fusion. - You can now see details for items that can be used at [Larpy's Altar]. - Summoned Pets will be visible to other users while in Town. - If you enter [Single Play] or [Multiplay] during a quest, you will resume the quest once you finish and exit. - You can now see your Prism / Diamond / Gold amounts in the Event tab. ㄴ Sentries will attack more often. ㄴ Sentries will be leveled up from Lv. 150 to Lv. 180. Sentry ATK / HP / Movement SPD will increase from this level up. - A buff system will be introduced to the Battlefield. ㄴ Sums up the CP of all players on the Battlefield, automatically giving a buff to the weaker Realm when there is a difference in CP. - Auction House unlock requirements will be changed. ㄴ Due to these changes, any items registered by a character under Lv. 100 will be no longer be registered and returned via the Mailbox. - Upon entering Brawl, you'll be sorted into Aslan vs. Harmion depending on your Realm instead of being matched randomly. - Condition to enter Brawl has been changed back to unlocking Chapter 1-1. 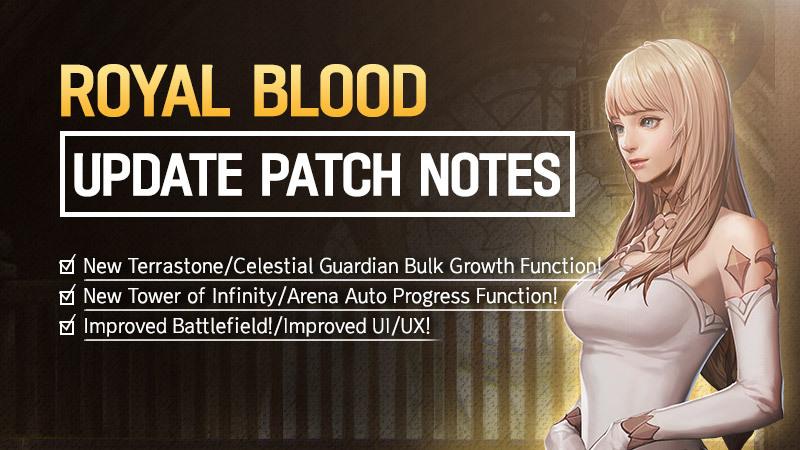 ㄴ Adjusted to be unlocked after Chapter 6 as a temporary response to hackers following the 12/20 maintenance. - Chapter 7 Boss Monsters appearances will no longer overlap with Brawl or Battle times. - Chapter 7 Field Monster rewards will be adjusted. ㄴ Due to the addition of a new mid-boss, normal monster reward drop rates have been reduced to compensate for increased boss drops. - Users using hacks to adjust their Attack Speed or Movement Speed will be automatically disconnected. - Energy Bubbles will now be refilled upon re-starting Arena. - Locked items will no longer be displayed as available at [Larpy's Altar]. - Skill use was ignored when encountering an enemy for the first time. - Characters would stop during Auto-Battle Hunting. - Auto Skill Lock would not register and used an Energy Bubble. - Terrastone amounts were not updated in real time when used as enhancement material. - An error message displayed when moving to Chapter 7 siege areas with Quick Slots active. - Characters were damaged even when staying out of Boss Monster Catastroph's attack range. - A Pet collection error pop-up appeared after touching an egg that has finished Hatching. - Unlock condition pop-up did not display when tapping a locked slot in the Incubator. - Pet Ranks were displayed in the previous language upon changing in-game language settings. - Text for the Lucky Pouch Package overlapped in English. - Information for the Spirit's Plumage item was not displayed when acquired. - Rest Rewards were displayed in the info when acquiring Equipment Enhance Stones. - Certain devices had screen gaps to the sides. - Effects for Shop-purchased Summon Tickets will be simplified when you use [Open Again]. - There will now be several banners in the HOT SALE tab at the Shop. ㄴ Tap the button on the bottom-left to check all available banners. - Purchase limits for the Accessory Transcend Pack have been increased from 3 times per 7 days to 5 times per 7 days. ㄴ You can find them at Shop > Event > Boost Up. Available only once per character. ㄴ Can be found at Shop > Special > Best Benefits. Can be purchased twice every 7 days. ㄴ Can be found at Shop > Special > Growth Specialization. Can be purchased 6 times every 7 days. ㄴ Can be found at Shop > Special > Growth Specialization. ㄴ Can be found at Shop > Event > Special Sale. Can be purchased once per character. ㄴ The following Costume set has the ability to increase Movement Speed. ㄴ The following package will be available until the 1/20 (Wed) maintenance. ㄴ 3 new Follower Packages: Gold (Alwadi) / Prisms (Yuris) / Diamonds (Moladi). ㄴ Can be found at Shop > Event > Special Sale. ㄴ These packages will be sold up till 1/30 (Wed) maintenance. ㄴ Summon Planar / Celestial Crystals at Shop > Summon Ticket > Planar Crystal. ㄴ Purchase 10+1 Tickets and you are guaranteed 1 Celestial Ticket. - Certain packages come with a bonus reward of Lucky Stones upon purchase. ㄴ Lucky Stone amounts and bonus reward conditions differs between each package. ㄴ Claim bonus rewards by tapping the [Claim] button on the package pop up message. - The following packages will no longer be sold. - The following events are scheduled to take place. - The following event is ending. Last edited by CM_Arcain; 01-17-2019 at 10:46 PM.